Insulated concrete forms create massive insulated walls and save concrete too. The insulation in your home’s ceiling, walls, and floor helps to slow heat movement, keeping your home warmer in the winter and cooler in the summer. Exterior and interior thermal mass walls have an averaging effect on the indoor temperature as the outdoor temperature varies. Heat accumulates in the mass during the day. Night temperatures and the cold night sky siphons off heat at night. This back-and-forth heat flow through a massive material is a slow process because it takes time to heat or cool the mass. That delay in heat flow subjects the indoors to the average outdoor temperature rather than the outdoor temperature extremes. Heavy masonry walls without insulation can maintain a temperature of around 70 degrees even as the hourly temperature fluctuates between 50 degrees and 90 degrees without any indoor space conditioning. Insulation, on the other hand, resists or limits the rate of heat flow. The R-value of insulation describes only a wall’s resistance to heat flow. Insulated mass results in a higher-than-expected R-value for the combination of mass and insulation. When you insulate the massive wall on the exterior, you both reduce heat flow and exploit the averaging effect of the mass. Studies performed by the Oak Ridge National Laboratory have confirmed the effect that massive walls have on home energy consumption. These studies show a “mass effect” for walls that increases the effective R-value of a home’s walls by a factor of 1.2 to 2.1 times. This improves the effectiveness of a heavy concrete or brick wall that measures R-11 to an effective rating of between R-15 and R-22. It’s not a large difference, and it’s still a good idea to install as much insulation as you can afford in your home. This mass factor could figure in when architects or builders design the homes of the future or recommend insulation retrofits for massive homes. High thermal mass walls are most effective in warm climates where the outdoor temperature varies widely between day and night. The best way to employ thermal mass is to maximize the surface area of the thermal mass facing the interior of a home. Do this by making the interior walls massive in addition to the exterior walls. The right combination of insulation to slow heat flow, and thermal mass to moderate temperature variations, can create a home that is both energy efficient and comfortable. Insulated concrete forms may be the most practical way of combining insulation and thermal mass in new homes. Saturn’s book Residential Energy: Cost Savings and Comfort for Existing Buildings summarizes ORNL research on insulation and thermal mass in Appendix 6. Also, visit the Oak Ridge National Laboratory’s Building Technology Center. Do you have experience with thermal mass walls? How were they constructed? Did they provide a more comfortable living environment? Post a comment below. For the last four years I have been building high mass homes. I like to use an ICF called Faswall, which is composed of cement coated wood fiber with a polyiso insulation to the exterior of the concrete structural cores. Claimed R values for this block are 25, which I felt was too low for me. So on the Ann Maechtlen home of 1000 ft2 I added 5.25″ of Eps (R 21) for a total R of 40+. The home has radiant slab heat. The average utility bill is $38.50 , averaged over the year. An electric hot water heater is used for a boiler. This is on Mission Power ( seven cents per KWH, I think). Ann burned 3/4 cord of firewood in a Morso 2B wood stove. My experience is that the mass effect is true, as Ann’s little home could out last cold spells. I really would like a energy scale to measure the mass effect. 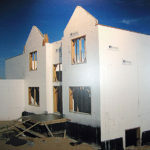 It is very hard to sell the High mass ICF due to the extra cost, as compared to a regular foam- concrete- foam ICF. Stick frames of 2×6 walls are the norm, and people relate to these prices, yet I tell them if they want to save a lot of money, go buy a four season tent from REI. just make sure to pitch it on a Hawaiian lava flow! Now there is high mass radiant heated floor! My shoes were starting to melt! Great point about the juxtaposition of mass versus insulation in a thermal mass wall. Here’s a more recent ORNL study that demonstrates the clear advantage of interior connected mass (as opposed to interior insulation): http://bit.ly/2c5761f. Figures 3 thru 7 clearly demonstrate that Intmass (interior mass) and CIC (concrete-insulation-concrete) outperform Extmass (exterior mass) and ICI (insulation-concrete-insulation) by a wide margin. This should be a wake-up call for those who sell, specify or advocate ICF wall systems.